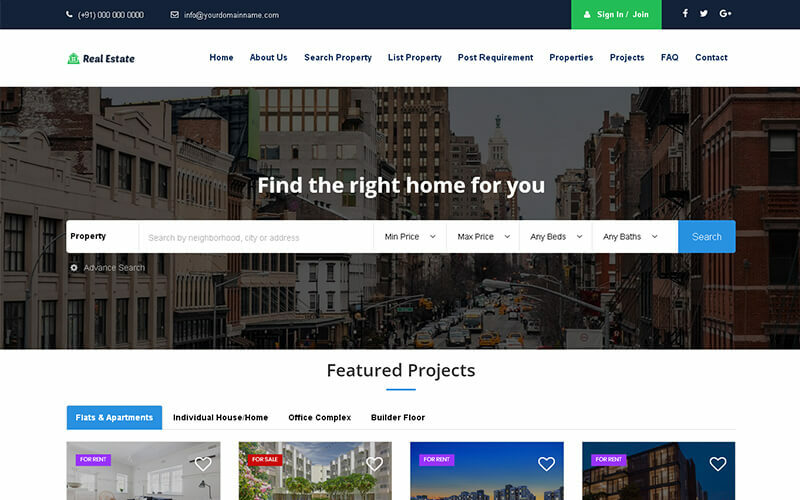 In our Magicbricks clone script; we have covered all the main features in which leading Real Estate websites, it contains all the features like 99acres clone script, Indiaproperty.com and Magicbricks.com. We have used some latest Technologies like PHP5.5.3/Mysql, AJAX to Develop Makaan Clone. Our realestate software has more secure and reliable script for your business. Here we have also added some more revenue making methodology like Google Ads and Banner Ads. You can get more revenue from the site visitors by collecting for premium membership and commissions etc. If you like to start your readymade real estate website script need not worry about that you are in the right place. This 99acres clone script, Advanced Real Estate Script definitely helps you to start your Real Estate Script. We have a responsive design and a user-friendly navigation which enables user to access from almost all the websites. We have also developed this script with SEO-friendly coding style in accordance with Google standards. View project features and amenities. The name of this script goes very well and it is quite true because it has really advanced features. I recommend all to buy this script and don’t keep searching on for further scripts. The customer support team, design and coding are good and cooperative. This is the best script I’ve bought. Their support is fast and helpful. This script offers so many possibilities to create a very slick and professional looking website. I’d have no problems recommending this script to anyone who wants a well-coded and highly innovative web presence.